This article first appeared in City & Country, The Edge Malaysia Weekly, on February 12, 2018 - February 18, 2018. Ask people what is the first thing that comes to their mind when they think of Klang and the chances are they will say food, specifically bak kut teh. Try heading to the bak kut teh areas during weekends and you will be amazed at how packed the restaurants are. The town is also known for its fresh seafood, while some would head to Little India for jewellery (gold) and traditional Indian attire. Driving into the area, the narrow roads and old houses are particularly noticeable — it is an old district filled with history, but does boast a few new developments. Traffic is normally heavy and congestion is the norm, if you ask frequent commuters there. The royal town was formerly the state capital. Istana Alam Shah is the official residence of the Sultan of Selangor and most royal ceremonies take place there. Other famous landmarks include the Klang Royal Town Mosque and Church of Our Lady of Lourdes. The history of the district where the royal town is located dates back to the days of the Malacca Sultanate, when small villages lined the Klang River. The area now boasts the largest port in Malaysia — Port Klang, formerly known as Port Swettenham. It was officially opened to traffic in 1901. Surrounding the port are freight companies and many industries. Bordering Kuala Selangor to the north, Kuala Langat to the south, Petaling to the east and the Strait of Malacca to the west, the district has two sub-districts — Kapar and Klang. The last census conducted by the Department of Statistics in 2010 shows that the district has a population of 842,146. This makes it the third most populous among the nine districts in Selangor, after Petaling and Hulu Langat. Klang has many public amenities for education, healthcare and sport. Most of the schools are government-run but there are several private schools, including Sekolah Sri Acmar, Wesley Methodist School and four Chinese independent secondary schools — Hin Hua, Chung Hua, Kwang Hua and Pin Hwa. Currently, there is only one international school — Regent International School Klang. But with a growing need for better education and demand for international curriculum, Acmar Group — the developer of Bandar Baru Klang — is developing Acmar International School, slated to open in June. Healthcare facilities include Hospital Tengku Ampuan Rahimah Klang, Columbia Asia Hospital Klang and Pantai Hospital Klang, offering a total of 1,586 beds. The district is accessible via the Federal Highway, New Klang Valley Expressway, Shah Alam Expressway and South Klang Valley Expressway. The upcoming West Coast Expressway will be linked to the area as well. Also coming up is the light rail transit line 3 (LRT3), which was announced in April 2013. The 37km line will start in Bandar Utama and end in Klang, passing through Shah Alam. Of the 26 stations planned, 10 will be in the Klang district and the stations’ interim names are Bukit Raja, Kawasan 17, Jalan Meru, Klang, Taman Selatan, Sri Andalas, Tesco Bukit Tinggi, AEON Bukit Tinggi, Bandar Botanik and Johan Setia. The line is expected to be operational in 2020. As it will be integrated with the mass rapid transit line 1, LRT Kelana Jaya line and KTM Komuter Port Klang line, the daily ridership is forecast to reach 74,000 passengers a day once it opens. According to CCO & Associates (KL) director Chan Wai Seen, certain parts of Klang are quite congested, especially during peak hours, due to the increasing number of developments there. “The areas that are not well planned are congested as well, and it is getting worse,” he says. 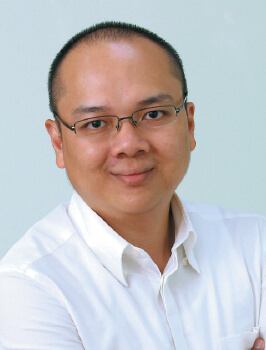 Landserve Sdn Bhd managing director Chen King Hoaw concurs. “Those in Kuala Lumpur, Petaling Jaya, Subang Jaya and Shah Alam who want to travel to Klang via the Federal Highway will have to cross Kota Bridge over the Klang River, which is the only link into town and its surrounding neighbourhoods,” he says. He adds that the Shah Alam Expressway in the south, and the New Klang Valley Expressway and North Klang Straits Bypass in the north provide direct access only to the other parts of the Klang district. In order to smoothen the traffic flow, the government has built the Klang Third Bridge, which connects Jalan Goh Hock Huat on the north of the Klang River and Jalan Sungai Bertih on the south, but it has not resolved the bottleneck at Kota Bridge. Nawawi Tie Leung Property Consultants Sdn Bhd research and consulting director Saleha Yusoff says public transport options in the district are limited, with only buses, taxis and the KTM Komuter serving the people there. “However, LRT3 is expected to improve the area’s connectivity, allowing people to commute easily from Klang to major employment centres in the Klang Valley,” she adds. Another challenge Saleha has observed is that the district, despite having one of the world’s largest ports, has not been able to attract major port-related and logistics businesses to set up their operation there. Most of them are located in Shah Alam, Puchong and Petaling Jaya. “This could be attributed to several factors, such as a lack of international-standard office buildings and, more importantly, a general lack of liveable elements that would have offered a balanced work-live-play-entertainment aspect of life,” she explains. Despite Klang being a rather old area, property experts say there is still demand for houses, mainly from owner-occupiers. 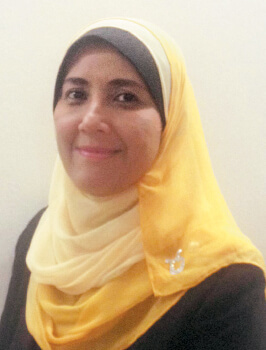 As for investors, Saleha expects the number to rise as more apartments and condominiums are built along the LRT3. Chan says with improved accessibility between Klang and other prominent areas in the Klang Valley, demand will come from not only Klangites but also from nearby districts. He opines that landed houses in well-planned townships will see the most demand. 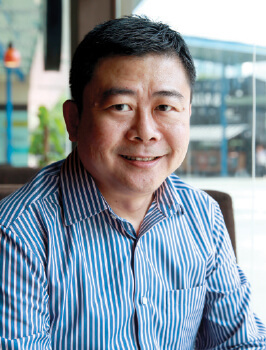 According to Chan, most of the residential and commercial hot spots in Klang are in well-planned townships such as Bandar Bukit Tinggi by WCT Holdings Bhd, Bandar Botanic by Gamuda Land, Bandar Bukit Raja by Sime Darby Property Bhd and Setia Alam (located on the fringe of Klang) by S P Setia Bhd. A quick online search shows that a 2-storey terraced house with a land area of 1,170 sq ft in Bandar Bukit Tinggi is priced at RM750,000. In d’Laman Greenville, also in Bandar Bukit Tinggi, a corner semi-detached house with a land area of 3,787 sq ft is selling for RM2.2 million. In Bandar Botanic, a 2-storey intermediate terraced house with a land area of 20ft by 65ft is priced at RM690,000, while an intermediate semidee with a land area of 40ft by 90ft is going for RM2.1 million. Listings for Bandar Bukit Raja are mainly for terraced houses, which are selling for RM500,000 and above, depending on their size. An intermediate 2½-storey terraced house with a land area of 26ft by 75ft is priced at RM1.2 million, while a slightly smaller 2-storey, 24ft by 75ft intermediate terraced house is going for RM830,000. A 2-storey, 22ft by 70ft end-lot terraced house is selling for RM750,000. At Setia Alam, an intermediate link bungalow with a land area of 45ft by 95ft is selling for RM1.5 million. A 2-storey intermediate terraced house with a land area of 20ft by 70ft is going for RM700,000, while a 24ft by 80ft semidee is priced at RM1.2 million. An apartment in Seri Pinang, with a built-up of 850 sq ft, is priced at RM288,000. According to Saleha, there tends to be a premium on the selling price and rent of residential and commercial properties along rail networks, and this has led to a lot of interest from developers, buyers and investors in developments along LRT3. She highlights a few noteworthy high-rise residential properties — Orchis Apartment in Bandar Parklands, The Palm Garden in Bandar Baru Klang, Tropika Apartment in Bandar Bukit Tinggi, and Vista Bayu, Vista Indah, Bayu Villa and Prima Bayu in Taman Bayu Perdana. Orchis Apartment is located 1.6km from the Johan Setia station while The Palm Garden is 600m from the Bukit Raja station. Tropika Apartment is 2km from the Tesco Bukit Tinggi station. 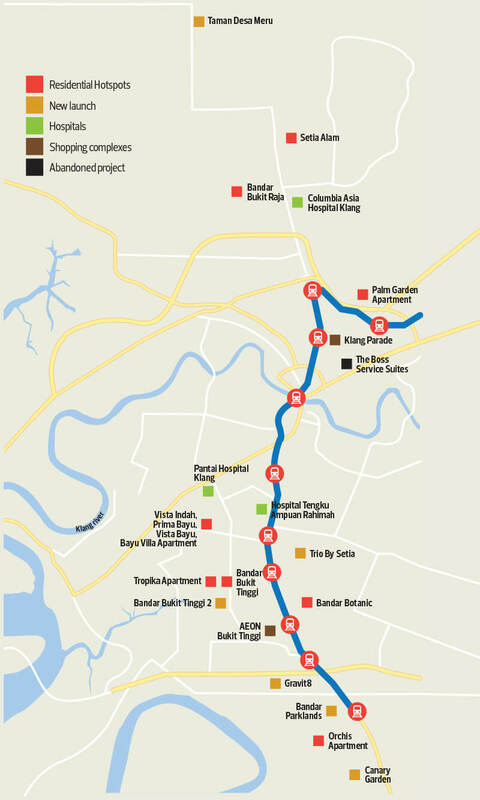 Vista Bayu, Vista Indah, Bayu Villa and Prima Bayu are between 1.2km and 1.8km from the Sri Andalas station. Saleha says The Palm Garden has experienced a significant appreciation in price, especially between 2016 and 2017 when values rose by almost 50%. The units have built-ups of 853 to 925 sq ft, and the average transacted price was RM133 psf in 2013, RM191 psf in 2016 and RM286 psf in 2017. The built-up of units in Orchis Apartment is 840 sq ft, and the transacted price was RM202 psf in 2014, RM308 psf in 2016 and RM324 psf in 2017. As for Tropika Apartment, the built-ups range from 760 to 850 sq ft, and the units were transacted at RM156 to RM254 psf in 2016 and 2017. Upcoming projects include residential development Central i-City, located on the fringe of the Klang district. In the district itself, there is the Berkeley Uptown serviced apartment project by Paramount Property. A number of developments have been launched along the LRT3 route. Located between 6km and 15km from the Jalan Meru station are Taman Desa Meru by MSN Development Sdn Bhd and Taman Desa Baiduri by Viva Homes in Meru as well as Persada, Casira 1 and 2, Azira and Serunai by Sime Darby Property in Bandar Bukit Raja. Serunai is the only high-rise development while the rest are landed properties. Trifolis Apartments by WCT in Bandar Bukit Tinggi 2 and Trio By Setia by S P Setia in Bukit Tinggi — both high-rises — are 2km from the AEON Bukit Tinggi station. Azaria Apartment by WCT in Bandar Parklands as well as Maple Residences @ Canary Garden, Ridgewood @ Canary Garden and Clermont @ Canary Garden by KSL Holdings Bhd in Bandar Bestari are located 1km to 2km from the Johan Setia station. Azaria Apartment and Maple Residences @ Canary Garden are high-rises while the rest are landed properties. Two high-rises, Nordica Residences and Adria Residences, in Gravit8, developed by Mitraland Group Sdn Bhd, are 3km from the Bandar Botanik station. Meanwhile, located in Jalan Batu Tiga Lama and near the Hokkien Association is a high-rise residential-hotel suites development called The Boss Service Suites by Hotwer Development Sdn Bhd. It was launched in 2010 and abandoned in mid-2015. It was reported in March last year that several property developers were interested in reviving the project. A unit purchaser, who declined to be named, says The Boss Purchasers Association had shortlisted a developer during its annual general meeting. Property experts, however, say they have not received any news of it being revived. “We see strong commercial developments in the immediate vicinity of popular shopping complexes such as AEON Bukit Tinggi, Klang Parade and Setia City Mall,” says Chan. According to Saleha, Klang is not a major location for offices, excluding shopoffices. It only contributes 6% of Selangor’s supply, or about 2.1 million sq ft of net lettable area. Between 2011 and 2016, the average net yearly absorption was 21,000 sq ft, compared with 162,000 sq ft in Shah Alam and 612,000 sq ft in Petaling Jaya. “Demand is limited and is driven mainly by local businesses, supporting services, and logistics and manufacturing companies,” she says. As for the retail market, it has evolved and most of the old, single departmental stores have been phased out, says Chan. 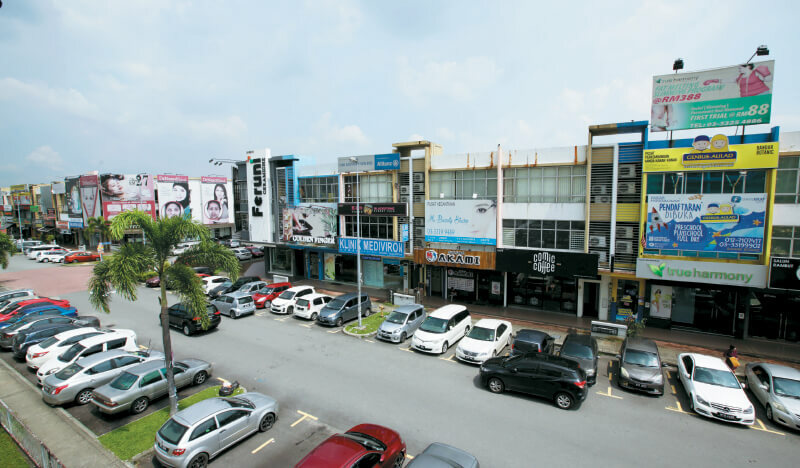 Most of the malls in Klang are located in established neighbourhoods and supported by the immediate population, which is a key success factor for retail developments, he adds. Chan says some of the malls have seen a decrease in occupancy rates, particularly after the implementation of the Goods and Services Tax in 2015. Nevertheless, the overall rate has improved, he points out. “Generally, the retail market in Klang is quite stable,” he notes. According to Landserve’s Chen, industrial developments are mainly located in Port Klang, North Port, West Port, Teluk Gong and Jalan Kapar. Notable recent developments are the Worldwide Industrial Park in Jalan Kapar and Selangor Halal Hub and Selangor Bio Bay in Pulau Indah, which is close to West Port. IKEA’s regional distribution and supply chain centre will also be located in Pulau Indah. Based on data published by the National Property Information Centre, the number of transactions of terraced factories in the district fell by 48.5%, from 398 units in 2011 to 205 units in 2016. The number of transactions for semi-detached factories decreased by 59% from a peak of 200 units in 2014 to 82 units in 2016, while detached factories fell from 88 units in 2011 to 53 units in 2016, a 39.8% dip. Transactions for vacant industrial plots also fell by 60.7%, from 313 plots in 2011 to 123 plots in 2016. Based on transaction records, Chen says the price of semi-detached factories increased steadily from 2011 until 2014, but have stayed flat in recent years. 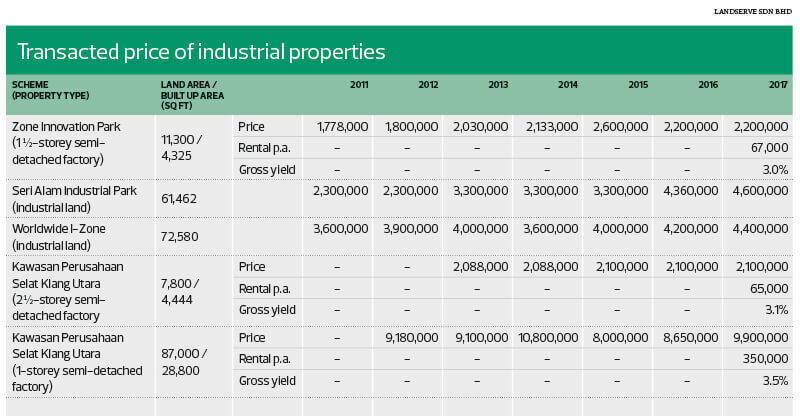 The price of a 1½-storey semi-detached factory with a built-up of 4,325 sq ft in Zone Innovation Park was between RM1.77 million and RM2.6 million from 2011 to 2015. In 2016 and 2017, the price did not budge, staying at RM2.2 million. Chan and Saleha believe the future of the Klang district lies in developments and land around the LRT3. “Once the LRT3 is completed, we expect more land in the vicinity of the transit-oriented development to be developed into mixed-use projects to cater for demand from the younger market segment,” says Saleha. She adds that older buildings in the area, especially abandoned shopoffices, will have redevelopment potential. Meanwhile, Klang will continue to be a cheaper development alternative to Petaling Jaya, he says. As for the industrial sector, Chen believes the long-term prospects are positive despite the drop in transactions. “The increase in import and export activities; the government’s initiatives to promote trade, particularly among Asean countries and with Malaysia’s other top trading partners; the push towards the fourth industrial revolution; the completion of the West Coast Expressway; and lower land prices (including for industrial land) compared with Petaling Jaya, Subang Jaya and Shah Alam are all factors that will drive demand for modern semi-detached and detached factories and warehouses, as well as industrial plots in the Klang district,” he says.